The logistics of getting to your Camino starting point should ideally be figured out in advance. It’s hard enough dealing with lack of sleep on a long flight and the jet lag without the worry of making more travel arrangements once you reach your destination. Fortunately, I was acclimated to Portugal’s time zone before I began my Camino, because I had already been touring the country for 11 days. Wherever you plan to start your Camino, the Rome2Rio website is an invaluable resource for figuring out the best way to get from A to B. It will show you train and bus routes, taxi companies, and different transport combinations , as well as the costs involved. The Rome2Rio website works well and so does the iPhone App, and you can use it to research your journey beforehand or book transportation on the fly. As we know, there are many different Camino routes and starting points. 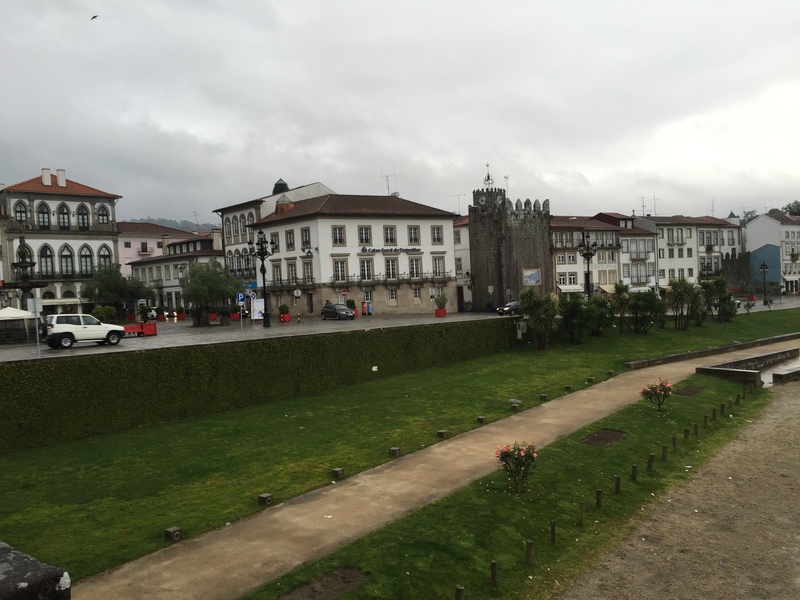 This post is about my experience getting from Lisbon to Ponte de Lima. 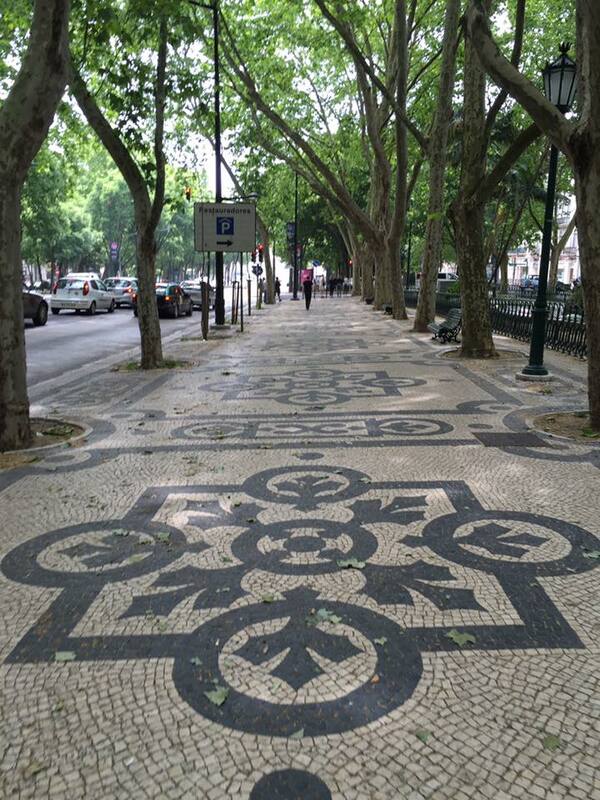 Avenida Liberdade’s mosaic stone walkway was a nice way to begin. For those walking the Camino Portugués, chances are you’ll fly into Lisbon. I highly recommend that you to stay a few days and explore this wonderful city and its surroundings. For ideas of what to see and do in the Lisbon area, read My Pre-Camino Tour of Portugal. Porto is the most popular Camino starting point in Portugal, and it is an easy 2.5-hour train ride from Lisbon. I took the same train, staying onboard an extra half an hour to its final destination of Braga (also a Camino starting point). From Braga I took a taxi from the train station to a bus station (not conveniently located together! 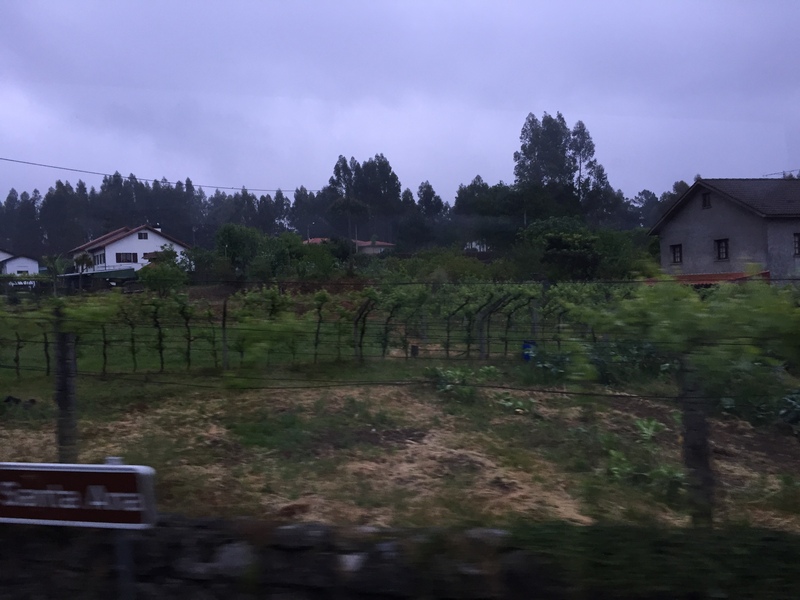 ), where I caught a local bus that drove an hour farther north to Ponte de Lima, the starting point for my short week-long Camino. After a power breakfast, I jettisoned a few items to lighten the load and completed the final packing of my Camino backpack. Normally I would take a cab from the hotel to the train station, but I had plenty of time before the 2 o’clock train and was so ready to start walking! I swear, my legs had been screaming to walk after being on the long bus rides of the tour for 11 days. And so my Camino begins. The walk to the train station was a very pleasant 2.5 miles (3.92 km) from the Marques De Pombal square along the tree-lined Avenida de Liberdade, Lisbon’s Champs Elysees. As I passed the upscale stores, I felt an incredible sense of freedom: I was finally on my own schedule and responsible for my own journey. What a coincidence that the first steps of my Camino were on Avenida Liberdade (Freedom Avenue)! A burden had been lifted when I separated from the big rolling suitcase I left back at the hotel, and I realized that all I needed for the next ten days was in that 24-liter backpack. How refreshing! With limited choices about what to wear, not only would the daily routine become more simple but my backpack would feel incredibly light, especially compared to any of my previous backpacking trips. I continued in the direction of the station through the pedestrianized La Baixa district, where people were eating lunch al fresco, and then along the waterfront, where the big cruise ships dock. Below are a few photos. Very nice train station. Free wifi! Clean bathrooms. What a difference from when we arrived on May 11. I was pleased that the Santa Apolónia railway station had very clean bathrooms and free wifi. When I got to the window to purchase my ticket to Braga, only first class seats were available. €45 was a bit of a splurge but so worth it to be able to relax, watch the scenery go by, and stretch my legs out. 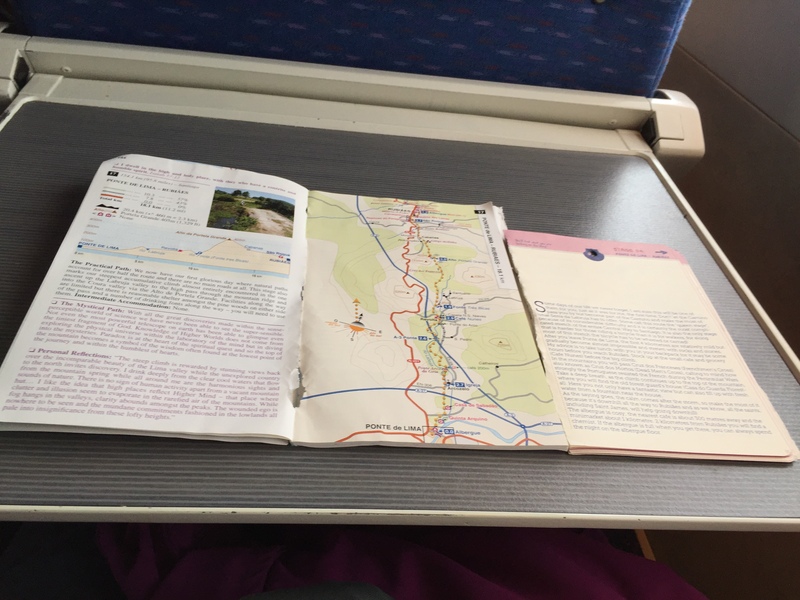 I had the chance to read my guidebook, write some notes, eat snacks, and take a nap. There’s nothing better than train travel! 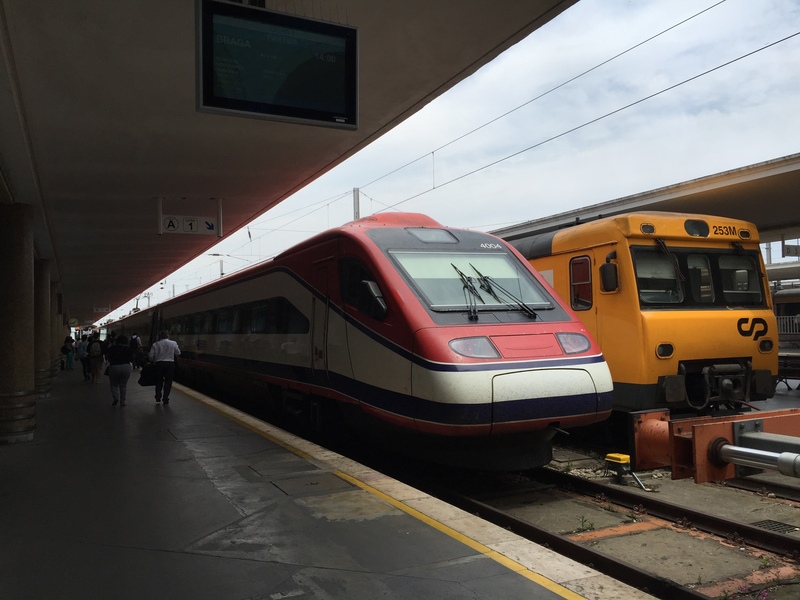 The red and white train runs from Lisbon to Braga. My backpack and trekking poles enjoyed the train ride too! The sections I cut out of my Brierley and My Way guidebooks. The full books would have weighed me down, and I only needed the last seven stages. Stowing luggage: A sneaky tip! So, what did I do with my touring luggage while I was away for nine days on the Camino? For the night before my flight home, I booked the same hotel where I had stayed on the last night of the Portugal tour. The hotel allowed me to leave my luggage there at no charge—sneaky and frugal! If you’re in a similar situation, find a hotel in a city that you depart from that can hold your luggage for you. 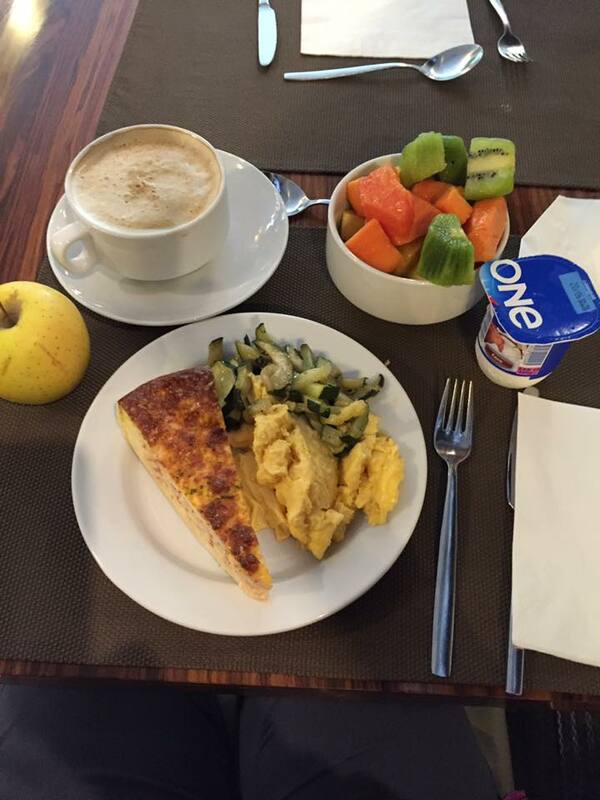 I was able to secure the Trafalgar Tour rate of €100 at the Hotel Turim Avenida Liberdade, a cost which includes a lavish breakfast buffet. (I checked booking.com and their lowest rate was €120.) 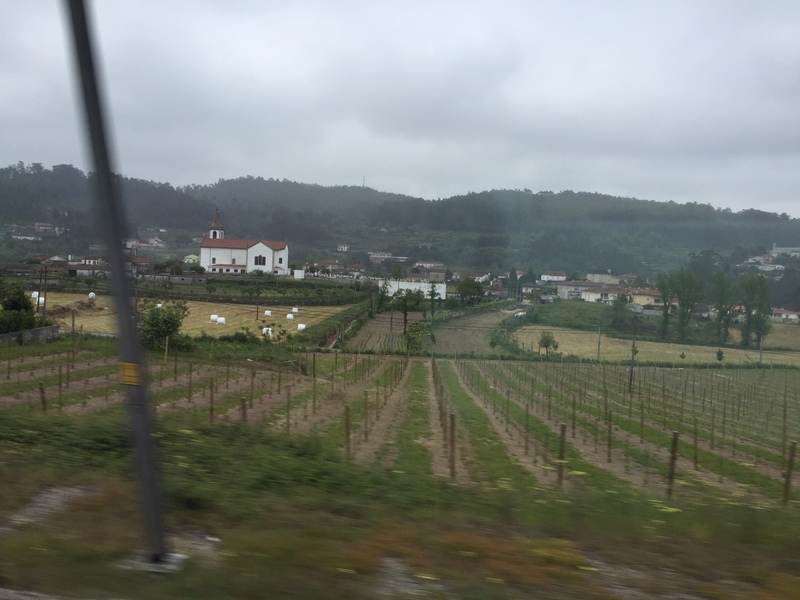 Though it sounds like a splurge for Camino standards, it was worth every penny for the convenience of leaving my luggage in a hotel I was familiar with, and it was better than checking my luggage into an airport or station locker. Hotel Turim Avenida Liberdade is a four-star hotel in a great location by the Marques De Pombal plaza. I did research on the Rome2Rio website to check options for returning to Lisbon and found out there are no direct flight. There are a series of trains you can take, but the fastest way is to take an ALSA bus for €54. It left Santiago at 12:00 p.m. and arrived in Lisbon at 9:00 p.m. There is an hour lunch break near Porto. We hit some bad traffic in Coimbra so it took an extra hour. Make sure you plan ahead for this extra day of travel. I was so relieved to have a reservation at the Hotel Turim. After that long bus ride from Santiago, it was just a quick metro ride from the bus station to Marques De Pombal, and a two-minute walk from there to the Hotel Turim. Easy peasy! Up next: Arriving in Ponte de Lima. I love Lisbon! And Portugual. Any place there is a good starting point I would guess. Looking forward to reading more. So true! I loved everything about Portugal. Appreciate the website that you gave Rome@Rio, which I can see will be helpful to our upcoming non-Camino trips, too. How to get to the starting point seems to be a very frequent question for Camino-bound travelers, and no wonder considering many starting points are tiny towns. Thanks Susan. Glad you found it useful. You and Ralph such savvy travelers. Good to hear you stow luggage at hotels too. I met you on the Lake Merritt walk a few months ago. I’m the one with the small dog(s). Well I finally have my flight booked to Europe this Monday Sept 20! I’ve been reading your very helpful tips. THANKS! Rome2Rio gives many great options but then I couldn’t find how to find the bus station address or even the bus station website. Please email or even call me.